Pencil sketch on plain paper. Color added digitally. 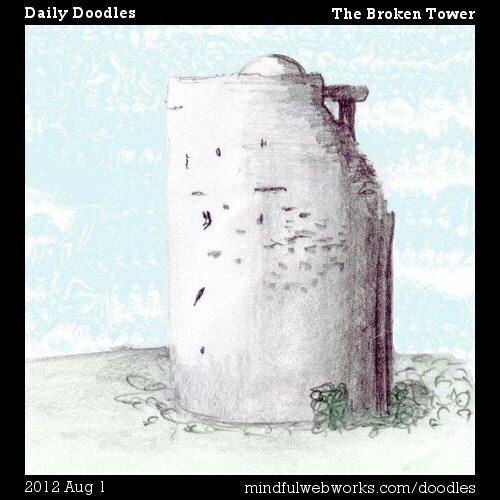 Welcome to the new Daily Doodles. It's been a while since the last original new Daily Doodle ran, 1997 November 11. The format back then ended with 450•450 pixels. These new doodles won't fit in that old frame, being slightly larger at 500•500. The old ones were PNGs as a standard, and now I've thrown caution to the winds and the standard will be JPG. Last time I made it to 250 not-quite-daily panels. We'll see how far this one goes. No guarantees. The subjects remain the same: whatever. No apologies for the unfinished line, the poorly-developed sketch, the under-detailed portrait — they're doodles! Sometimes funny, sometimes arty, sometimes you'll wonder if I just did that to fill a day. (Probably.) Many of the originals are not newly doodled, but have been accumulating in drawers and notebooks and file folders for many years. Some go back even before the original run. Bonus Feature: Starting tomorrow, the original Daily Doodle run will be displayed below the new ones. Be sure to scroll down the page for the whole show.